Tubkaek Beach is ideal for discerning travelers seeking a semi-private retreat where they can revel in the bay's tranquility and enjoy one of the finest viewpoints in the region to watch the sun set against the silhouettes of Koh Hong, an Unseen Thailand tropical gem. 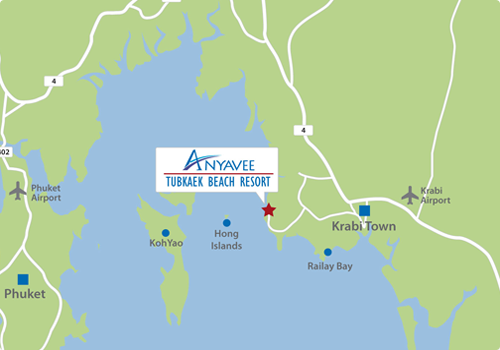 Anyavee Tubkaek Beachfront Resort Krabi is located approximately 45 minutes from Krabi Airport (KBV), with direct flights landing domestically from Chiang Mai and Bangkok, as well as from regional destinations including Singapore and Kuala Lumpur. Phuket International Airport (HKT), which is just over two-hours' drive away, offers some 200 flights arriving daily from all corners of the globe. Younger visitors to Krabi and party-goers tend to gravitate towards Ao Nang, which at around 15 minutes away, is still within easy striking reach should guests wish to have an evening out.